Tulsi’s scientific name is Ocimum Tenuifloram and in English it is called Basil. Tulsi has been of great importance in Indian culture. Indians have a history of using tulsi for more than five thousand years. It has been present since time immemorial. It not only is sacred in Hindu culture but has many medicinal properties which have been used since ancient times. The basil or tulsi has three types, namely Rama tulsi, Krishna tulsi, Vana tulsi. Each of these have its various properties and tastes. The parts which generally are used in tulsi are its leaves, roots and seeds. Due to its ability to cure many diseases it has been used in various ways. Here we will share with you some of the benefits of tulsi. The benefits of tulsi are 3 fold and can be broadly categorized into hair, health, skin benefits. Tulsi has many benefits but we will start with the benefits which it has for your hair. Take tulsi oil and massage it to your hair and scalp regularly it will enrich the quality of your hair and energize your hair. You hair will look more strong. Just add some tulsi oil to your regular oil say coconut oil and massage your scalp regularly and you will come over the problem of dry scalp. It is generally one of the biggest reasons for hair loss thus it will also help reduce hair loss. Well not just it benefits your hair but since ancient times tulsi has been used for treatment of various problems like cough, cold, mild fever etc. Tulsi has properties which helps cure mild fever and common cold. It is a very good disinfectant which helps secure one from viruses. Not just this but it also have properties which prevent some deadly diseases like malaria and dengue. Tulsi has properties which strengthen the kidney. Tulsi mixed with honey helps remove renal stones. Further tulsi is also a detoxifying agent beneficial for kidney. It is a great remedy for persons suffering from diabetes. It helps in a sudden drop in the sugar level of the body. It restricts the vessels that feed tumors, further it also acts against many cancers like breast cancer. It also reduces the effects of mouth cancer caused by consumption of tobacco. It is not an exclusive treatment of cancer though but it aids in the process of treatment which is a great thing. It helps in reducing the craving of lighting a cigarette and having a smoke. So all those people who are willing and wanting to quit smoking they can use tulsi as an effective tool for the same. Just keep some tulsi leaves in your pocket and whenever you feel like smoking take out a leaf and eat it. It is way better that electronic cigarettes and other measures which help quit smoking. Not just for your hair and skin tulsi is great for the skin too. It has anti-oxidants which are highly beneficial for the skin. It also has antiseptic and purifying qualities which help prevent skin diseases. 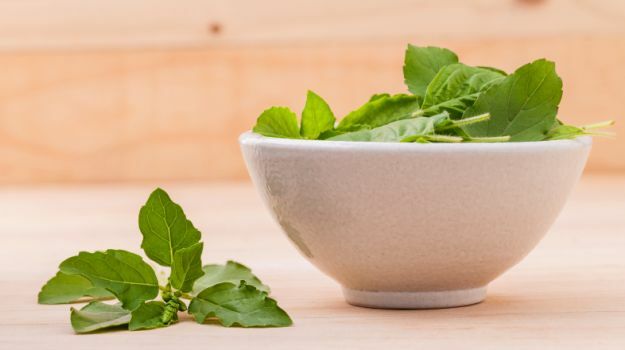 Tulsi helps in the intrinsic as well as the extrinsic development of skin you can eat the tulsi leaves after washing or make a paste of the leaves and apply it on your face. The former will help your skin get better for the interior while the latter will clear your face from outside thus fighting acne and pimples. A tulsi pack on your face gets rid of your scars and marks. Eating finely powdered tulsi or even tulsi leaves adds to the glow of your face. Shoe Diaries With Rina Dhaka: Clarks Launches New Brand Campaign ?? Harmful Chemicals Used In Beauty Products…Warning! How To Select The Prefect Eye Brow Shape According To Your Face Type!